Russian President visits Turkey, agrees with Erdogan on de-escalation zone in Syria's Idlib province. Russian President Vladimir Putin said on Thursday that the right conditions exist for the civil war in Syria to end. Putin made the comments during a visit to Turkey, where he met with President Recep Tayyip Erdogan, AFP reported. The two leaders Thursday agreed to push for the creation of a "de-escalation" zone in Syria's key northern province of Idlib to help end the civil war. Erdogan said after the two held talks in Ankara that they had agreed to "pursue more intensely" the implementation of a de-escalation zone in Idlib, which is currently under jihadist control. The Russian leader said Russia and Turkey would work to "deepen coordination" on ending the over six-year civil war, adding the right conditions now existed for the conflict to end. 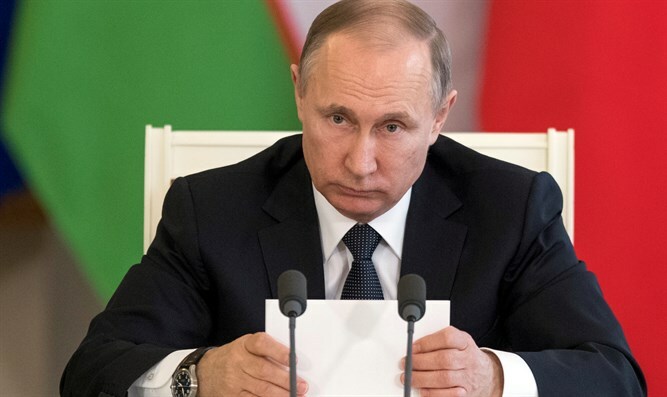 "De-facto, the necessary conditions have been created for the end of the fratricidal war in Syria, the final defeat of terrorists and the return of Syrians to a peaceful life and their homes," said Putin, according to AFP. Russia and Turkey would work "with the aim of deepening the coordination of our joint activity to solve the Syria crisis," he added. The Russian President noted that the work to implement the agreements made at recent peace talks in Astana has "not been easy" but the sides had already "succeeded in having a positive result". Erdogan said that the two sides had reaffirmed their determination to work closely and show a "joint will" to end the Syria conflict. Turkey and Russia have been on opposing sides during the war in Syria, with Russia backing Syrian President Bashar Al-Assad and Turkey supporting rebels seeking his ouster. Turkey and Russia were in a state of open tension, after Ankara shot down a Russian fighter jet on the border in November of 2015, killing two Russian officers. In response, Russia issued vast sanctions on Turkey dealing serious financial damage. Ankara and Moscow have been working closely since a 2016 reconciliation deal which ended the crisis.